The past four months have been precious ones since REACH Community's Sunday Gathering was launched. The promise of the Lord's presence when two or more are gathered in HIS Name has been fulfilled faithfully again and again. As we prepare to move into our new facility the days have been full of painting, hauling lumber, moving boxes and there are more good times to be had. Excitement and expectation are in the air... along with the smell of fresh paint. This Saturday a team of volunteers from the REACH Community will be meeting at the facility for building and cleaning projects to prepare for our Grand Opening. August 19th we will welcome any and all from the Northshore and Greater New Orleans Community for the Grand Opening of our new facility as we launch into this new season. 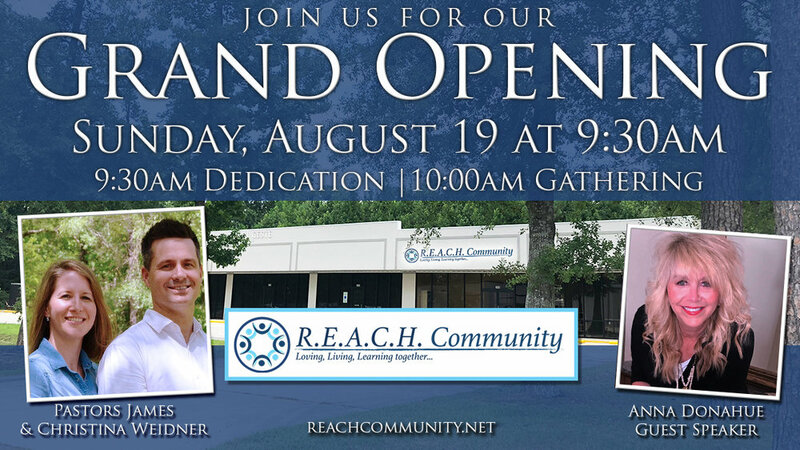 On August 19th we are planning a 930am reception and dedication followed by our 10am Main Gathering. It will be a special time with our friend and guest speaker Anna Donahue joining us along with greeting videos from other friends. It's about much more than the four walls of a building. It's a launching point for the mission of REACH Community to grow, bringing hope and light to the people of the Northshore, Greater New Orleans, Louisiana, and the World. Coming Soon after the Church's Grand Opening we will be launching the REACH Learning Community on Fridays from 9am onwards. This is an intentional time that will include morning chapel and character building, music and theory training, project based learning, peer discussions, and youth connect group. This Fall EQUIP ministry school will be launching on Wednesday nights beginning with a Biblical Leadership class. Then prayer and revive nights will soon follow in September. If you are seeking intentional community come say hello.